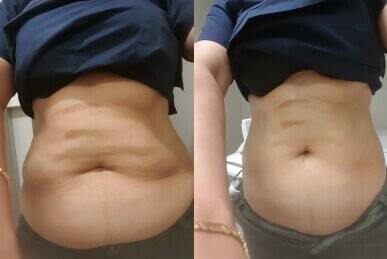 The Photo is a same day photo after fat freezing followed by fat cavitation to tighten the skin, our machines, real people, no photo shop. Without the fat cavitation the skin would be loose with wrinkles. Fat cavitation vs weight loss in Sydney – Top 10 benefits of fat cavitation in Sydney. Fat cavitation really is a great tool for removing unwanted fat and cellulite. It is great for tightening the skin and improving skin texture. This really is a wonder treatment that can’t be underestimated. The fat cavitation machine has a number of tools that produce ultra sonic sound waves. These waves are strong and focused. What they do is vibrate the fat cell walls to such and extend they break. This kills the fat cells and the body remove the dead fat cells from the body. Simple, yet devilishly clever, I wish I thought of it. Fat cavitation, a fantastic weight loss tool people forget. A quick and effective, removes unwanted fat and suborn fat from all areas. Can get in and treat areas fat freezing and Laser liposuction can not. Tightens the skin, improves skin texture. Removes cellulite. WOW, it’s really like a Swiss army knife. If you are not sure you can book in for a free consultation and talk to an expert. Wiki what is fat cavitation? Fat cavitation sounds great, I will come into the shop. Great post\Nice post, i like it very much.I was really lucky to discover your website. It has a lot of helpful info!